Free Shipping Included! 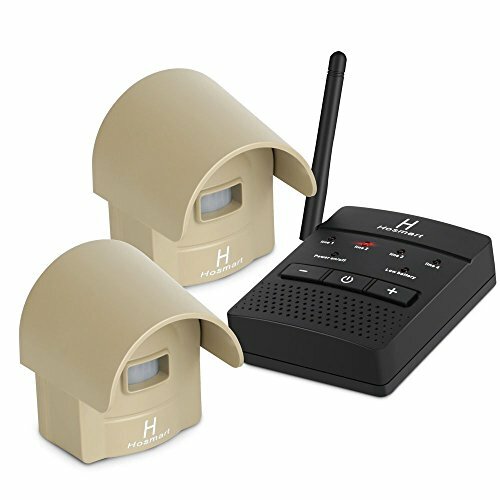 1/4 Mile Long Range Hosmart Rechargable Wireless Driveway Alarm System & Driveway Alert System Outdoor Weatherproof Security Motion Sensor & Detector by Hosmart at Defy Now. MPN: HY757-02-2. Hurry! Limited time offer. Offer valid only while supplies last. Wireless Driveway Alarm features The Hosmart Motion Sensor with Wireless Motion Alert is a convenient and affordable safety / security system. View More In Security Sensors. The Hosmart Motion Sensor with Wireless Motion Alert is a convenient and affordable safety / security system. 1.weatherproof outdoor sensor with adjustable sensitivity control. 2.The sensor may be placed up to a 1/4mile from the base unit in ideal condition. 3.Alerts with light and sound when vehicles or pedestrians approach within a 30 feet radius. 5.Super simple to set up. Takes only a few minutes to set up. Easy do it yourself installation. Sensor can be powered by included rechargeable 18650 Li-battery. HOSMART ADVANTAGE - 30 years+ wireless driveway alarm and intercom home systems produced in our own factory with our leading edge systems technology. Wireless Driveway Alarm Includes 1 Battery/AC Powered Base Receiver and 2 Sensor. SUPER LONG RECEVING RANGE - 1/4 mile (in ideal situations). Our range is double the ? mile competitors claim under ideal conditions. We use newer technology components and excellent manufacturing techniques. Our system has been real world tested in settings with trees, buildings, walls, and vehicles. It easily achieves a 1500FT wireless range in most conditions. It¡¯s been tested through thick forestry, hail storms, gusty winds, heavy rains, scorching heat, and snow. EXCELLENT QUANLITY - Outdoor sensor is made with industrial grade PVC housing, rubberized weather/water resistant seal, and a sunshade. If you have any questions about this product by Hosmart, contact us by completing and submitting the form below. If you are looking for a specif part number, please include it with your message.